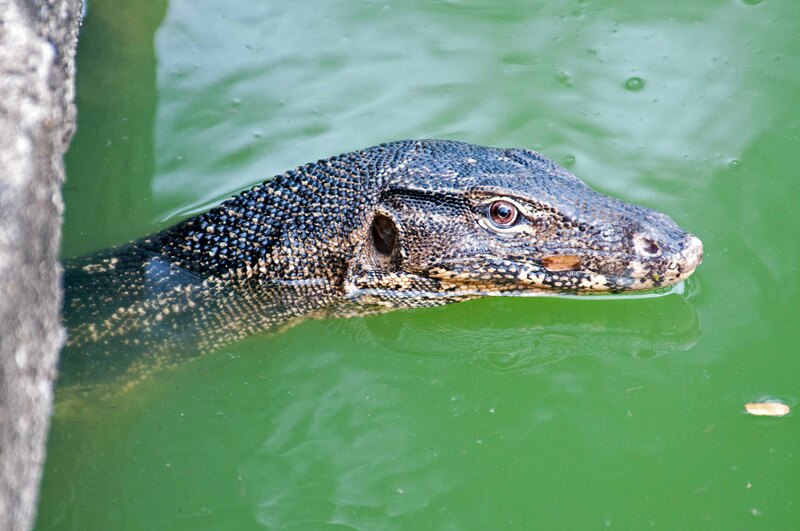 The Southeast Asian water monitor, a large lizard called Varanus salvator subspecies macromaculatus, occurs throughout southern Asia and Southeast Asia. It can grow very large, apparently up to 3 m in length, although most adults are about 1.5 to 2 m long (1). Big enough! The males are larger than the females and can weigh up to 50 kg. 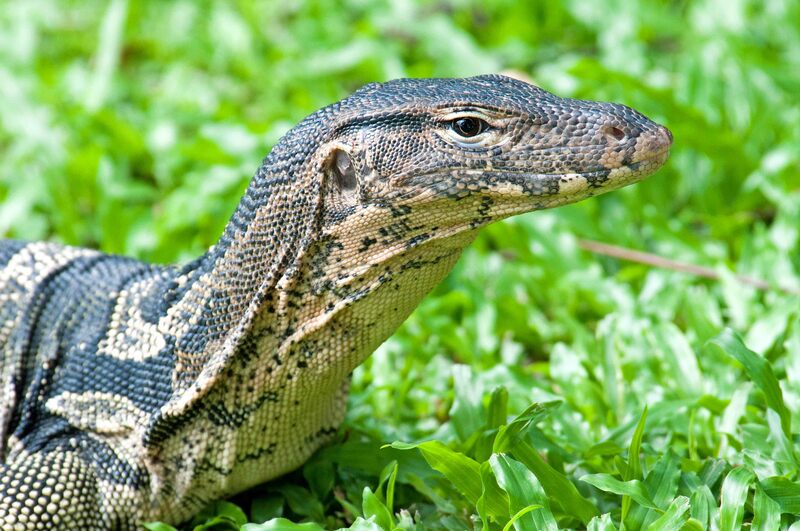 Their big cousins, the Indonesian Komodo dragons (Varanus komodoensis), are of course much larger and weigh up to 150 kg. Anyway, these Bangkok dragons are impressive enough. 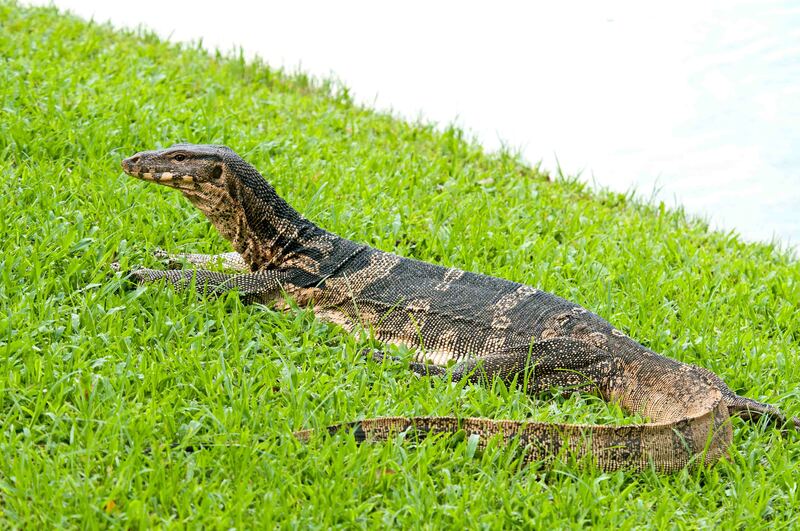 The water monitors have adapted well to life in Bangkok – I expect they have been there throughout the history of the city – and can be seen in many places, including klongs and canals; most prominently in Lumpini Park. 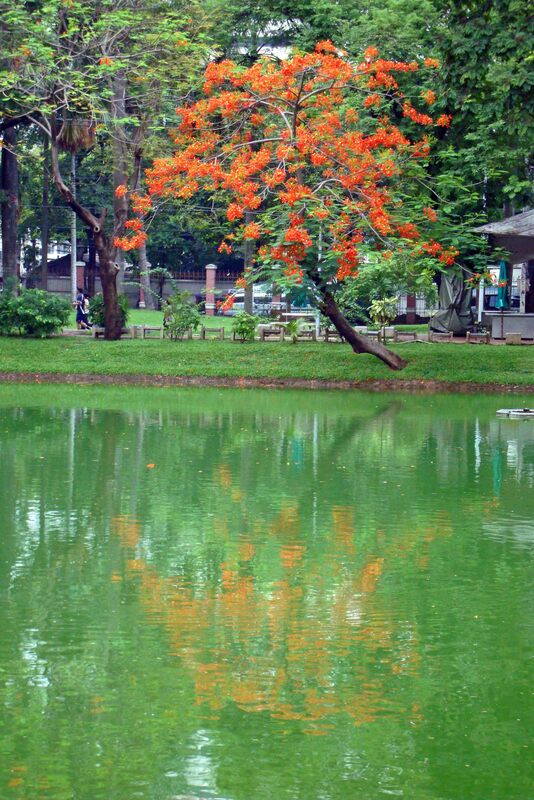 Lumpini (or Lumphini or Lumpinee) – สวนลุมพินี in Thai – is a 142 acre haven of peace in the centre of Bangkok. It is a place were it is possible to see a surprising number of birds and other animals, including these amazing reptiles which have become used to people (albeit with a degree of wariness on both sides). 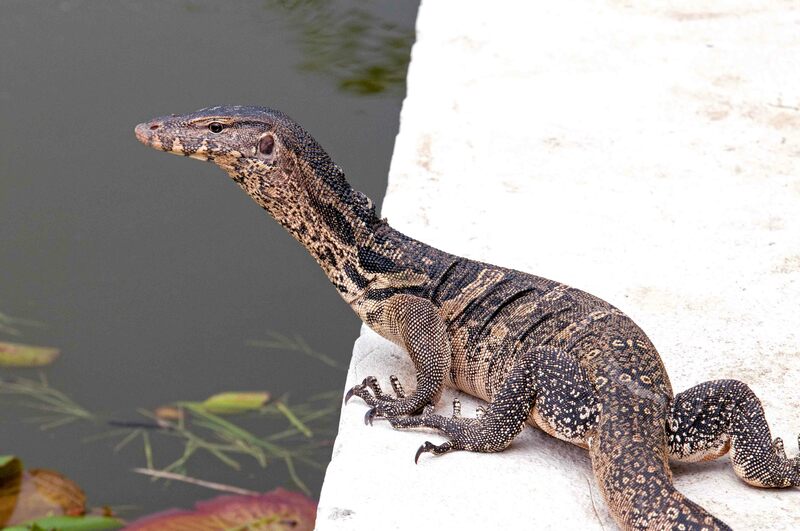 The water monitors are said to do a useful job of helping to keep the city clean, by feeding on edible rubbish and so on and controlling insects, snails and rodents (2). They are predators as well as scavengers. 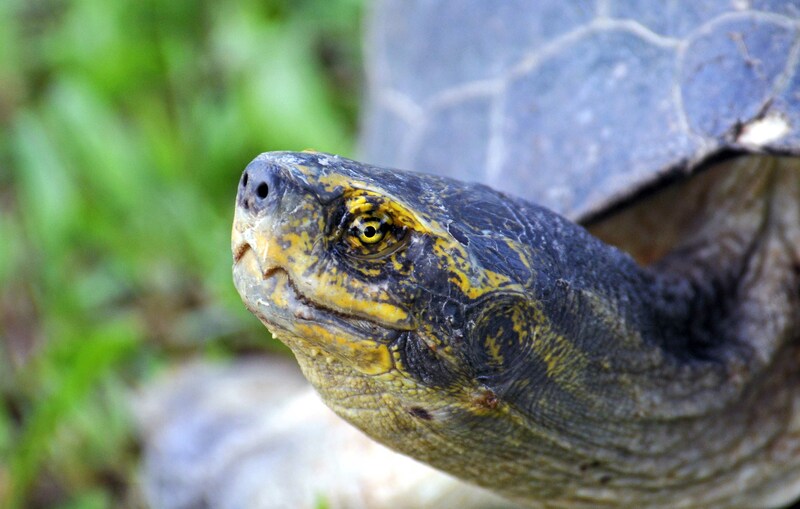 Their natural habitat is a burrow in a river bank, so the water culverts which open out onto the artificial lakes in the park provide them with ready-made homes. They can be seen swimming in and out of these concrete tubular openings. 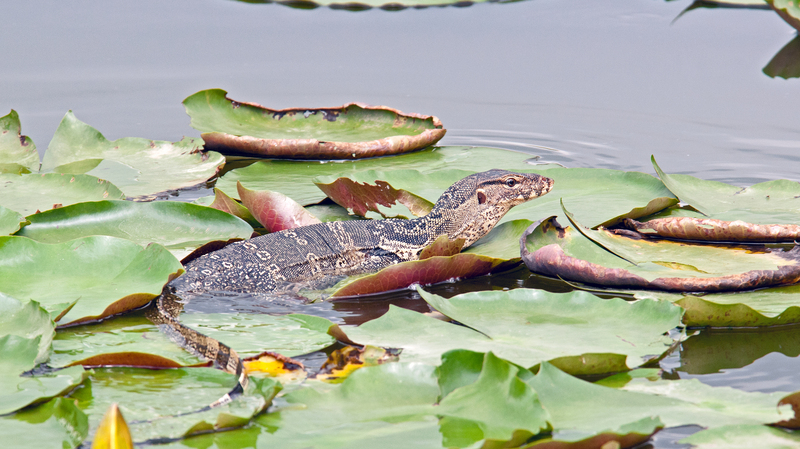 Asian water monitors are excellent swimmers and have been seen swimming between islands in southern Thailand (3). 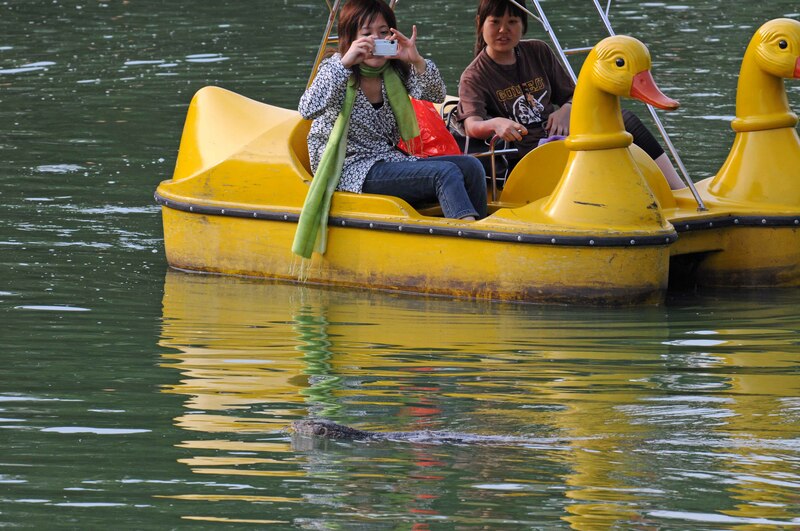 So the lakes in the park provide no challenge and they can be seen swimming alongside some of the pleasure boats, much to the amusement of tourists. I expect they also take a number of other species which are found in the park, especially frogs, birds (eggs) and even turtles. Although, perhaps it’s even-stevens, as herons and egrets will eat baby monitor lizards if they get a chance. It all seems to work out. There is a picture of a water monitor trying to swallow a fairly large turtle on the Internet! Fortunately, this Yellow headed temple turtle which was resting on the shore of the lake in Lumpini Park was much to large to get eaten! 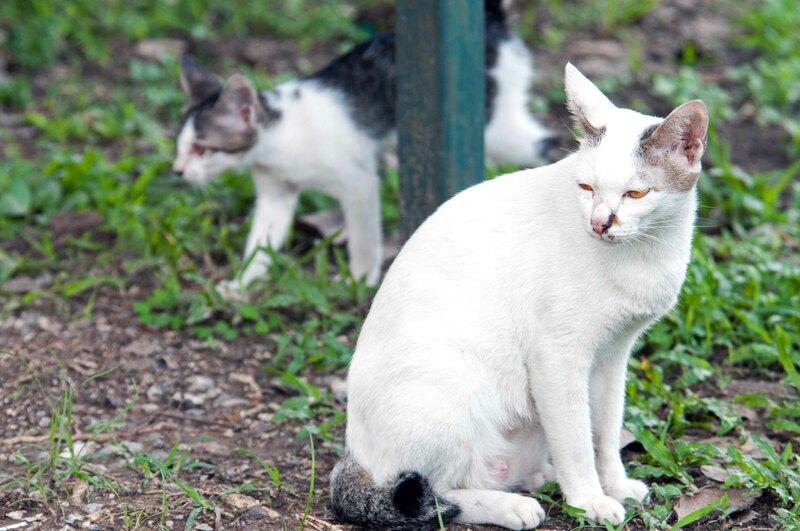 There are also lots of cats of all shapes and sizes living in Lumpini Park, but I expect they are far too smart to get caught and eaten by a lizard, however big it might be! 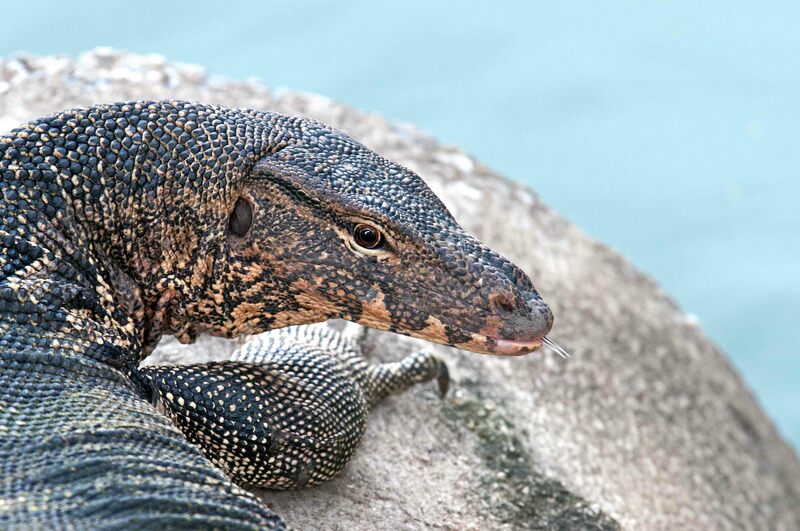 But monitor lizards are no slouches. According to one expert, they ‘can count, have memories, have shown map knowledge, and plan ahead’ (4). That’s more than some people I know! They can look quite scary, especially when they flick out their forked tongue, tasting the air! In Indonesia they are turned into shoes and handbags! There is reportedly a reptile leather industry which exports ~40,000 skins from that country (1). 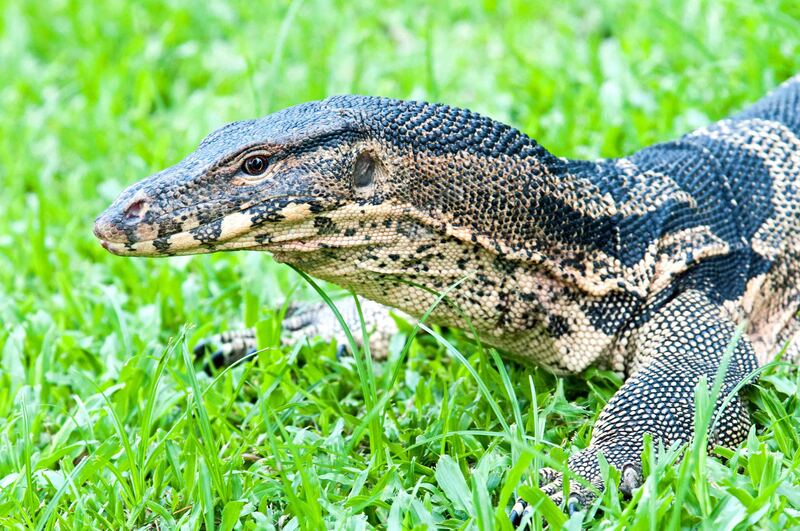 According to one report, over 20 million monitor lizards were killed for their skins between 1995 and 2005 (4). They are also eaten for food, although they are a protected species in Thailand (2). I don’t think I would like to eat one from the sewers, but it would probably depend how hungry I was! Anyway, I always enjoy seeing animals that have adapted well to Man’s environment, and these creatures appear to be thriving in the parks and canals of BK. It is perhaps no coincidence they do so well as Thailand is a Buddhist country and respects wildlife, even though these lizards are supposedly a symbol of bad luck. Maybe that is why they are left alone. They have been on this planet for an awful lot longer than us, so let’s throw them a bit of respect.